"Home for fantasy campers before and after camp"
We are fantasy camp alumni who had a fantastic time at camp and made some great, new friends. Seeing those friends once a year at camp was not enough for us. We decided to organize some tournaments with our good friends from the Los Angeles Dodgers Fantasy Camp (See Dodgertown West Home Page). These tournaments were a big success and have evolved into annual events. In 2001, the Giants campers formed their own San Francisco Bay Area league which played a schedule starting in March and ending in October. The three-team league eventually grew to six teams when the Oakland A's fantasy campers were invited to enter two squads. 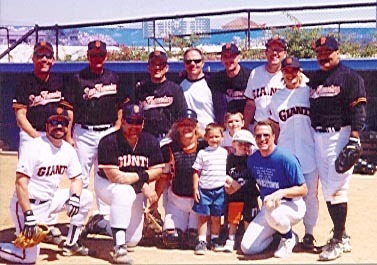 In 2006, the Giants campers formed a non-profit organization to help run the league and tournament events and it was called the West Coast Fantasy Baseball Association. In 2010, the WCFBA Board of Directors voted to mix the Giants and A's league players into one single player draft and make all of the A's official members of the WCFBA. This is your site for information on tournaments and other activities for WCFBA members. This site is not affiliated with the San Francisco Giants, San Francisco Giants Fantasy Camp, the Oakland A's, or the Oakland A's Fantasy Camp. We are a volunteer organization and need member help in putting together our events. This web site should relieve some of the communication burden from volunteers and save on some of the mailing expenses that are incurred. We would like the team managers to take on more of the responsibility of handling their team rosters such as batting order, defensive alignment, and player availability. Let us know if you have any other ideas. I�ve been told that some folks are confused about how our baseball organization is organized and who we may or may not answer too. I�ve also heard lots of rumors and innuendo surrounding who is eligible for our league and tournament events. Sounds like it is time for some clarification . . . The West Coast Fantasy Baseball Association (and any of its former incarnations) has never been associated with the San Francisco Giants or any of the contractors that have run their fantasy camp. The group was formed by former campers for the purpose of organizing tournament events and maintaining friendships. All the work done for each event is voluntary and the association is officially recognized as a non-profit organization. The Giants and their contractors have no say in how our events are run and their presence at any event is by invitation only. Any questions? Who can play in our events? If you have ever been to a Giants fantasy camp, you qualify to play in our events (both league and tournament). It doesn�t matter if you went in 1986 or 2006, you are eligible and welcome to join us. We have also made special exceptions for some players to join us who have been to other fantasy camps or have played in other organized leagues with some of our members. These special exceptions are granted to folks we know will fit in well with our group and its goals. Nobody here is going to win a World Series and nobody should have a �win at all costs� attitude. We are always recruiting new players to join us. Just because somebody has missed a tournament or part of league play doesn�t mean they have to wait until next year. We have plenty of events to fill the time when you can join us. At this point, we basically play the year round. Do you know of any former Giants campers who would be interested in joining us? Let them know what we are doing and if they are interested, send me their email address. I will add them to our distribution list and send them an introductory email explaining who we are and what we do. This is what is known as a solicited email and cannot be construed as spam. If at any time, a recipient wishes to be removed from our distribution list, I will do so immediately. NOTE: Per our bylaws, we invite anyone who has played at ANY fantasy camp associated with a professional ball team to participate with us. It is not limited to the San Francisco Giants. Please refer to section III.1 of the bylaws. During the course of the 2006 season, Doug Rusch put in countless hours to file the required paperwork to make the West Coast Fantasy Baseball Association a non-profit corporation. By becoming a non-profit entity, we see benefits regarding our ability to rent facilities, rent them at a lower cost, gain insurance discounts, and receive tax exempt status. What Doug has done is a behind-the-scenes effort, but without his work, our costs are much higher and we may not be able to play at some of the facilities we have had the privilege to play at. Please thank him for his efforts. What follows are the documents which we must make available to retain our status. They are in Adobe PDF format so you must have the free Adobe Reader to see them. If you don't have it, I've provided a link where you can get it for free! First off is our ByLaws . . . West Coast Fantasy Baseball Association - By Laws Version 3.1. Games have a two and a half hour time limit to insure the daily schedule is completed. Visiting and home teams will be determined prior to the start of each tournament. In order to make our games a safe and enjoyable experience, we have made some modifications to the standard baseball rules. We WILL play the game of baseball except for the following changes which will reduce the potential for injuries and provide a competitive environment for all players. It is important to note that the umpires are NOT responsible for the enforcement of all rules. Batting order, courtesy runners, and pitching limitations are enforced by the coaches. If a coach believes one of the rules is being violated, they should call time and discuss it with the opposing coach. STEALING: Stealing of bases is not allowed if the pitcher delivers from the stretch position. If the pitcher goes into a full wind-up with runners on base, runners may attempt to steal. However, under NO circumstances may a runner steal home. LEAD OFFS: Runners may only lead off to the cutout of each base before the pitch is delivered. Once the pitch is delivered (leaves the pitcher's hand), runners may take a secondary lead. PICK-OFF PLAYS AND OVERTHROWS: Even though there is no stealing when the pitcher is in the stretch, runners are still susceptible to pick-off throws by both the pitcher and the catcher. PITCHER - Per standard baseball rules, the runner must be tagged out if the pitcher attempts a pick-off move. If there is an overthrow on an attempted pick-off play by the PITCHER, all runners may advance without retagging their bases. CATCHER - A throw to an occupied base by the catcher can result in a force out. In other words, a runner must beat the catcher's throw to the base - it is NOT a tag play. If there is an overthrow on an attempted pick-off play by the CATCHER, the runner occupying the base that was thrown to must go back and tag up before advancing. ALL OTHER runners may advance without retagging their bases. The wild pitch or passed ball makes contact with the backstop - The ball is dead and the runner(s) move up one base automatically. This includes runners on third base advancing to home and scoring. No defensive play can be made. The wild pitch or passed ball does NOT make contact with the backstop, but the runner(s) are attempting a legitimate steal as outlined in Rule #1 above - In this case, the runner(s) must have begun the attempted steal before the pitch crossed the home plate area. The ball is live and runners may advance at their own risk. The wild pitch or passed ball is a dropped third strike which will be scored per normal baseball rules - If first base is unoccupied with less than two outs or there are two outs AND the third strike to a batter is not fielded cleanly by the catcher, the ball is live and all runners (including the batter) may advance at their own risk. A runner on third base may attempt to score on a dropped third strike since this is not considered to be a steal attempt. FREE SUBSTITUTION OF PLAYERS ON DEFENSE: Any team player can substitute for another player on defense at any time. FULL BATTING ORDER: Barring injury, all players on the team must hit (not just the nine currently in the field). The batting order is rotating. In other words, the leadoff hitter for game #2 is the batter who was in the on-deck circle when the final out was made in game #1. The same applies to game #3's leadoff hitter which is based upon the final out of game #2. TIME LIMIT: No new inning can begin after the two hour and 25 minute time limit. The umpire maintains the master clock which each coach should synch up with prior to the start of the game. Games are expected to start at their scheduled time unless prior games were delayed. All infield practice, umpire pre-game meetings, and pitcher warm-ups should be completed before the official starting time of the game. Opposing coaches should coordinate their infield practice so each team has the same amount of time to use the field without affecting the starting time of the game. � Prior to the game, each team will be allowed to designate up to two players in their batting lineup who are to be replaced by courtesy runners once they have reached base. Once the game has started, NO changes or additions can be made to this designated player list. � When a player who is currently playing the catching position defensively is still on the base paths with two outs, a courtesy runner can be employed. This is not mandatory, but it does allow the catcher to get their gear on and be ready for the start of the next half inning. � The last recorded out is the player who exits the field when the last out was recorded. � In the event of a double play, the last recorded out is the second out recorded. � If a runner is required in the first inning of a game and an out has not yet been recorded, the runner shall be the last player in the batting lineup provided they do not also require a runner. Since a team�s designated runner list must be set before the game, any batter who is unable to run the bases after the start of the game must be removed from the lineup and the lineup will be collapsed. When that player�s position comes up again in the lineup, they will be skipped, but no out will be recorded. It is permissible for any such player to continue playing defense, but they cannot be added back to the batting lineup. Team coaches are responsible for insuring that the correct courtesy runner is used. The opposing team can challenge whether or not the correct courtesy runner is used and if they challenge successfully, the runner will be removed from the bases and an out will be recorded. Any challenge must take place before the runner in question scores or the half inning concludes. OUTFIELD PLAYS AT FIRST BASE: A batter running to first base on a ball hit on the ground to an outfielder cannot be forced out at first base on a throw from the outfielder. It is permissible for the outfielder to have their throw relayed to an infielder and then to first base to achieve a force out, but they cannot throw directly to first base. WOOD BATS: Wood bats will be used. Exceptions to this rule are men 60 and over and any ladies who choose to use metal bats. SLIDE OR GET OUT OF THE WAY: In order to avoid injury, runners must slide or get out of the way if there is a play at the base they are attempting to advance to. For example, if a ground ball is hit with a runner at first which results in a play at second base, the runner from first must slide into second base or peel off toward the outfield so the fielder may attempt to turn a double play if they so wish. Even if a double play is not in order, the goal is to prevent unnecessary collisions resulting in injury. THREE HIT BATTERS PER GAME: ** NEW FOR 2013 ** A pitcher must be removed from the pitching position if he/she hits three batters with pitches in one game. That person cannot return to the pitching position during the course of that game. The policy DOES cover loss or injury to individuals who are not involved with the tournament group. A good example is a passerby outside of the facility who is struck by a foul ball. Most stadium organizations will require this coverage before they will allow any groups to use their facility. As part of their responsibilities, all league managers and tournament hosts need to report any accidents requiring medical attention. Should there be any such accident during a West Coast Fantasy Baseball event, fill out the following form and return it to the league commissioner (for a league game) or the tournament commissioner (for a tournament event). They will make sure it is filed with our insurance representatives. Acquiring fields for league games and tournaments has become more and more difficult over the years. Competition for facilities is heated and those that do rent their fields out want to know they have somebody they can trust. Use the link below to print out a sample letter which you can use as a form of introduction. Feel free to replace my name and contact information with your own.